Thursday started off just like any other double shift at Rocco’s. I began my day with a coffee and egg and cheese empanada before the 12-hour workday, where I would either bank or bust. The morning showed little promise of more than a free lunch. With only three tables the entire day I went on my break, praying for a miracle. It was Game 5 in the NBA Finals, and the Miami Heat were up by three games. If they won this one, the games were over and the Heat would take the championship title. 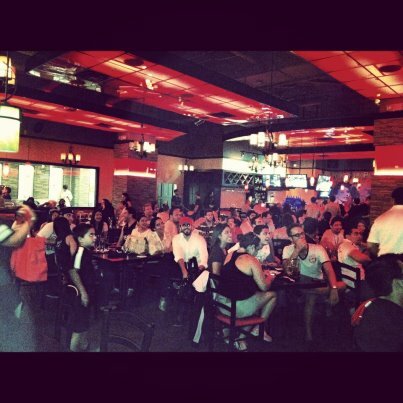 The NBA Finals gets restaurants in the area filled to capacity. I really did want the Heat to win, since I am a four-year-resident of South Florida. But, if they won that meant no more games. No more big business, which equals Ramen noodles for severs in the restaurant business. A seven-game series is what I wanted. An hour before the game, the restaurant began to fill–fast. And then came the problems. “I don’t have any silverware,” said a girl trying to eat her pizza, which could’ve very well been hand held. I rushed to the back to roll up two forks and a knife before frantically telling the bus boy to help me out. “We need a pitcher of Yuengling,” another one of my tables said. “We’re out of pitchers,”the bartender, Rico, said. “We would like to order food, but we have no menus,” another table of twenty-somethings said. “We’re all out of menus,” the hostess said. “Hi could I take one of your menus for my other table,” I asked a woman, trying to make things work. “Guess you guys aren’t used to this capacity,” a customer said. I was running around grabbing cocktail, after pitcher, after glass of wine. But, no matter how long the food took to make it to the table, the fans still smiled and their buzzes didn’t fade. The energy in the room was uplifting and my stressed mood began to fade. My forced waitress smile turned into a real one. Although I am more of a football fan than basketball, the pride in the room was contagious and I felt honored to be in Miami for this moment. I even snapped a video on my phone to capture it. My customers gave me high fives before walking to their cars. We now had a special bond, we were all at the same place in this moment of sports history. Now, back to a normal Friday night as a waitress. Share your Heat moments or pictures my facebook page! Read here for the complete game story!